What fun people had in the mid-20th century when they would go down to the corner drugstore for a little scoop of Fosselman’s, Thrifty, or homemade ice cream. Soda shops and diners were a hallmark of American middle-class life, and were popular with teens and young adults for years and years. People gathered, talked, and laughed. While things have changed, much of it has stayed the same: ice cream shops are still a great place for a date, or to meet up with friends after a long week of work. Unlike the 50s and 60s, though, we can take our favorite ice cream home from the sweet little shop…if we want. This American favorite has a long reach and is deeply loved by generation after generation. Melty, sweet, creamy, and fun, ice cream makes bad days into great days, and is a spectacular break from diets and stressors. Ice cream is something we love to keep at home as much as we like to go out to have with friends we don’t get to see often enough. 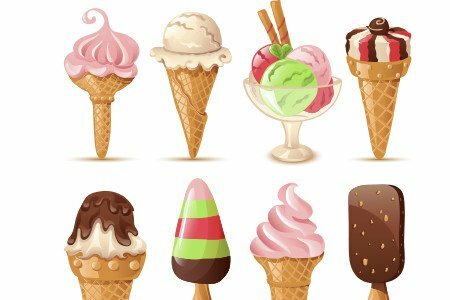 Ice cream all over is generally made with milk, cream, eggs, and flavorings, but ice cream made from milk will always have wonderfully varied and wild flavors. Mochi is an amazing treat from the wonderful country of Japan. Rice dough is beaten and stretched, and then wrapped around ice cream to make a little pod of goodness. Some mochi is only eaten at certain times of the year, and other mochi is a dessert for any and every day. Mochi isn’t the only wonderful dessert filled with ice cream, though. Ice cream sandwiches, made with cookies and ice cream, are extremely popular all over the world, and more people are discovering the magic of ice cream cakes. Ice cream compliments fruit pies, cakes, cookies, and many other types of pastries. Gelato is Italy’s answer to American ice cream. Creamier with a lower fat content and calorie count, gelato is a dreamy finish to any delicious dinner that you can have while in Europe. Gelato boasts a lower melting point than ice cream, and will make great memories. If you love ice cream, but want ice cream’s handsome brother, gelato is what you want! Ice cream is a an absolutely wonderful treat, provided that you don’t suffer from lactose intolerance. When a person is unable to digest milk, it is usually because the lactose, a protein in milk, irritates the lining of the stomach, and they are unable to digest it. For those that live with lactose intolerance, there are many options, and fruity sorbet is one of them. Made of a mixture of primary fruit puree, water, and sugar, sorbet is a cold, sweet alternative to ice cream that is non-irritating to those who are lactose intolerant, or allergic to milk. Sorbet is available in dozens of different flavors, varying from shop to shop, city to city, and country to country. If the possibility of eggs in sorbet isn’t something that appeals to you, ice cream made with coconut milk has recently become popular as a vegan alternative to both ice cream and sorbet. Creamy and smooth, coconut ice cream is a great item to get from a health food store, or to make with family at home. Don’t think you can’t treat coconut milk ice cream as you would any other ice cream: add vegan cookies, vegan cake or candies, and snack away!